Featuring interviews with almost everyone that worked on the film except for Richard Moll and a few others, this is a well made and entertaining making of. We learn that the film was originally supposed to be a straight horror film, but when Fred Dekker started working on other projects, the script writing duties were given to Dekker’s friend Ethan Wiley, who would take the idea for the film and add a lot of comedy to it. 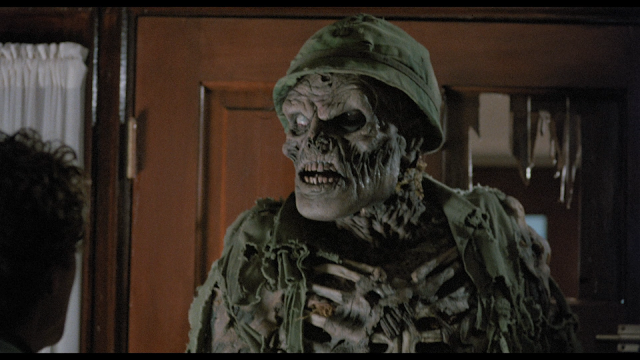 From there Steve Miner and Sean S. Cunningham came aboard and turned the film into what it is today. I love making-ofs and this is no exception. Almost every facet of the film is talked about, from the casting to the effects to the film’s release and ultimately its success. This is a making of worth watching. This is a making-of that was produced during the filming of the House. We get a lot of behind the scenes footage, as well as vintage interviews with the cast and crew. This is really worth at least one watch just to see what making-ofs used to look like. Pictures from the film, set, and posters are shown while the score to the film plays. This teaser plays up the fact that Steve Miner and Sean S. Cunningham made some of the Friday the 13th films. The score from that series is used in this trailer. 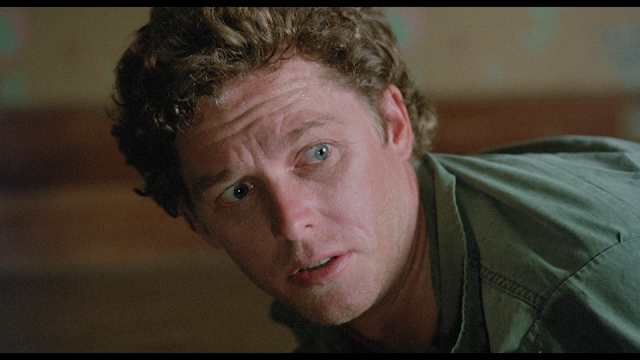 Featuring Director Steve Miner, Producer Sean S. Cunningham, Star William Katt, and Writer Ethan Wiley, this is a very fun and funny commentary. Recorded for the Anchor Bay release in 2000, this commentary has a lot of overlap with the new making-of found on this disc. I didn’t mind that so much as the stories would be told in a slightly different way than told in the making-of, which helps keep them fresh. All four guys are recorded together giving a very talky track that shows that these guys love being around each other. A definite listen. Note: House comes as part of a box set, but does contain its own case. I will review the whole set when each disc has been reviewed. 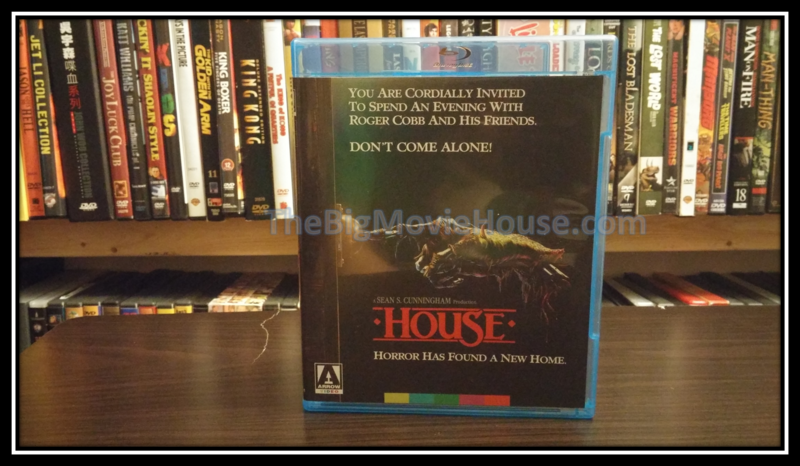 House comes packaged inside of a blue (Arrow usually does clear cases, but used blue cases for some reason) two disc blu-ray case, housing both blu-ray and dvd versions of the film. Everything is the same on both discs with the dvd, obviously, not being in HD. We get reversible cover art with one side being the theatrical poster for the film and the other being a brand new commissioned piece done by Justin Osbourn. I personally love the original theatrical artwork, but the artwork done by Mr. Osbourn is nicely done and captures film and its characters very nicely. 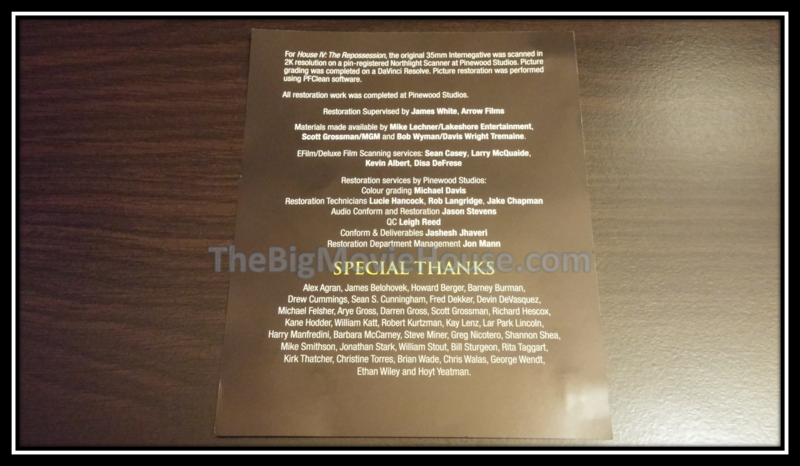 The back of the box gives us a plot summary of the film as well as the special features contained on the discs. The disc art contains the commissioned Osbourn artwork with Skeleton Big Ben threatening us with a hunter’s knife on the blu-ray disc. Roger, Harold, and Aunt Elizabeth on the dvd. 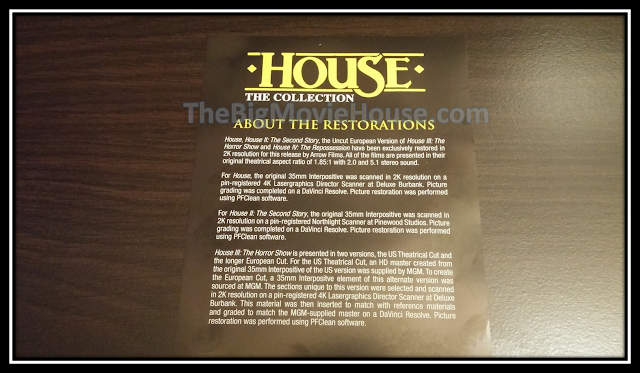 Also inside this case is the “About the Restorations” info that is usually found in the booklet that Arrow puts into their releases. This info is found here because of the book that it is found in the box set. Arrow has given us transfer prepared by Lakeshore and supervised by Arrow Films in 2K and in the film’s original aspect ratio of 1.85:1. This is a nice looking picture. There is a nice level of grain and the structure of said grain is intact. Colors appear as they should and the blacks are deep. I saw no image manipulation, such as DNR or crushed blacks. As usual, Arrow has delivered in the picture department. 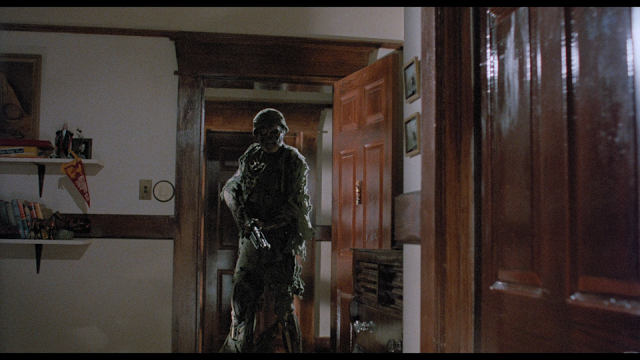 The house is appears larger in the Anchor Bay release. We also have more information on the left side of the frame and less of the right side. There is also slightly more information on the top of the frame in the Arrow release than in the Anchor Bay release. 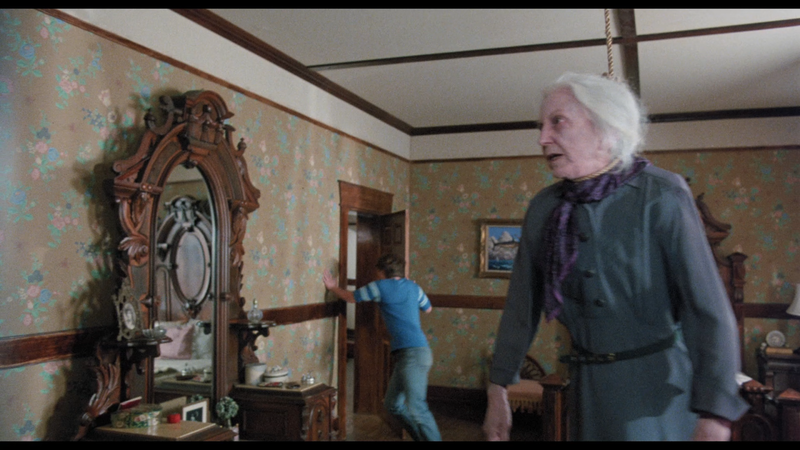 There are also a few shots in the film where we see things that were not intended to be seen, like the edge of a few sets, the arm of the boom mic operator, etc. Most of this stuff flies by that you may not even notice. 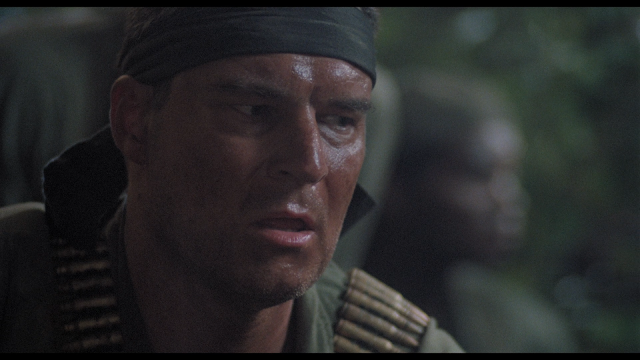 I did notice the boom operator while watching the film, but noticed nothing else. When I see the screencaps, I can see what I missed, but to me there was nothing wrong with the picture as I was watching. So now that that is out of the way, what do I think of the picture? I think that it is fine. There are people that are going to find something to complain about anyways. 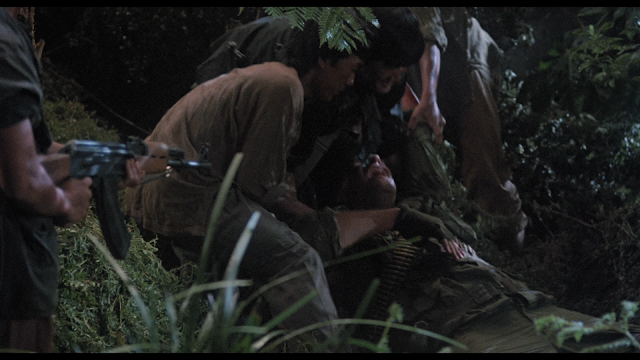 Like I said before, I found nothing wrong (except for the boom operator’s arm) while watching the film. I liked what Arrow had done with the look of the picture and think that the composition looked fine during my viewing. I will dock the score a little bit because of the change in composition, but the picture still looks great. The main soundtrack has been given the HD upgrade and it sounds well enough. The film is not heavy on effects, so the audio is a bit more low key. When the effects do show up, the track kicks into gear, giving us a nice emersion effect. Dialogue is also clean and clear and I did not hear any distortions to the track itself, although there are some anomalies that are inherent to the film so they would be there no matter what was done to it. All in all, this is a really nice track. 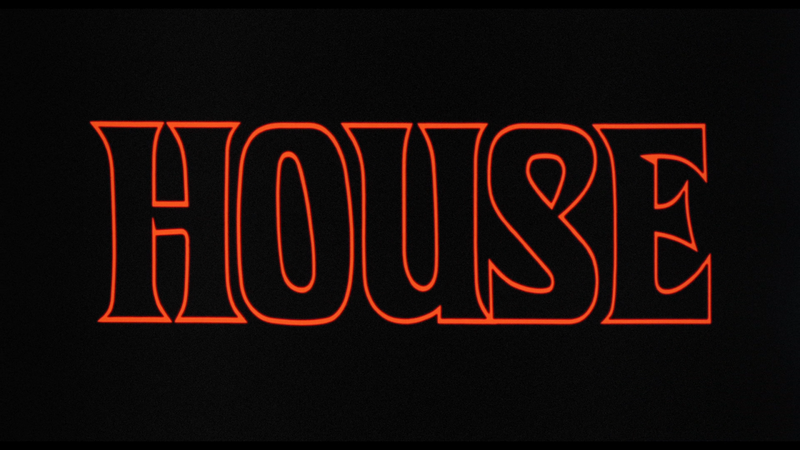 One of the first R-rated films that I ever saw was House. My mother and aunt had rented it from the video store and they were watching it in the living room while I watched TV in another room. I could hear them laughing, and me being the curious type, went into the room to see what the fuss was about. On the TV screen I see two pairs of legs with talking coming out of the speakers. Then out of trash bag that sits in between the legs, a white (painted not Caucasian) hand crawls out of the bag. I found this scene very funny. I was about six or seven at the time, but the humor was slapstick based. I had no idea what this thing looked like because I came in after the hero decapitated the thing, but with the hand looking the way it did (not too pleasant), I knew that it had to be something disgusting. How could it not be? My mother asked me if I wanted to watch the film after her and my aunt were done, and I told her that I did. After my aunt went home, my mother rewound the tape, and began the film from the beginning. Since this was a New World Pictures release, there was a preview for Clive Barker’s directorial debut, Hellraiser, which I really wanted to see, but my mother told me that I would have to older for that. Once the film began, I found that I was watching a different kind of horror film than what I was seeing advertised at the time. Sure, there were horrific things that happen in the film, but nothing that I hadn’t seen before in PG-13, or even some PG rated films. I had seen Conan decapitate a few people in Conan the Destroyer, so I figured that I knew these kinds of things. After the film, my mother asked me what I thought of it. I told her that I liked the film, but found that funny stuff didn’t meld well with the horror elements. For a six or seven year old these were big things to be saying. How would I have known these terms? I don’t know (and still don’t know to this day how I knew them at such a young age.) No one I knew was talking about this film. They were all into slasher films, and while I was into slasher films as much as I could, I really didn’t know too much about them yet. I just thought that the horror worked and the comedy worked, but not together. As I watched House for this review (the first time I have seen the film in at least fifteen years), I was reminded about what I had said of the film back then. The film starts out like a comedy. A grocery delivery boy walks into the house of the person he is delivering groceries too and finds her hanging from the ceiling. 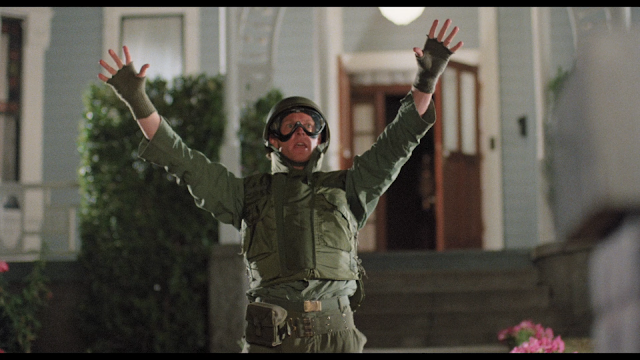 This is after he says one of the funniest lines in the film: “Mrs. Hooper. It is me, Grocery Boy.” This line made me laugh and it is one of the only true laughs I found in the film. The film then cuts to a writer (William Katt) who is at a signing for a book he wrote. It is kind of weird that he is autographing paperbacks of his book, but I guess that is how it was in the 80’s. Anyway, he is trying to write a book based on his experiences in Vietnam. He finds that he can’t write in the city, so he moves into the house of his dead aunt to see if he can get the creative juices flowing. 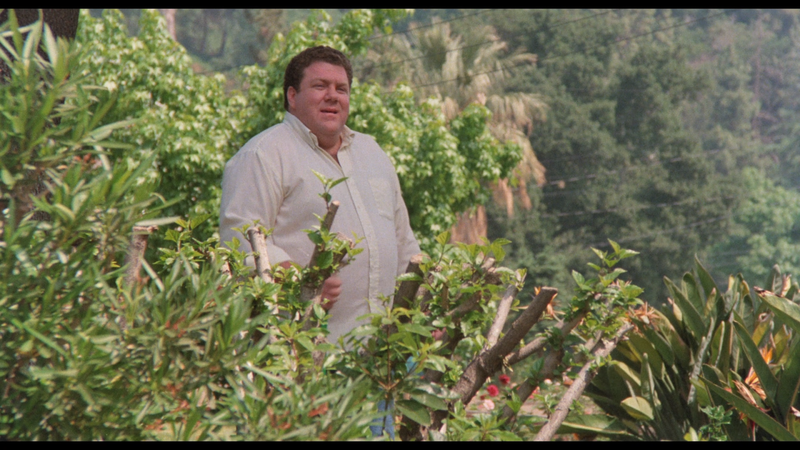 He meets his neighbor, Harold (George Wendt) and they hit it off pretty decently. That is until he sees what happens when he opens the closet in the master bedroom at midnight. Opening said closet at said time leads to another dimension where monsters seem to live. This is what made his aunt commit suicide, although Roger (the writer) starts to believe that she didn’t kill herself, but was convinced and helped in her death. The house starts to play tricks on Roger. 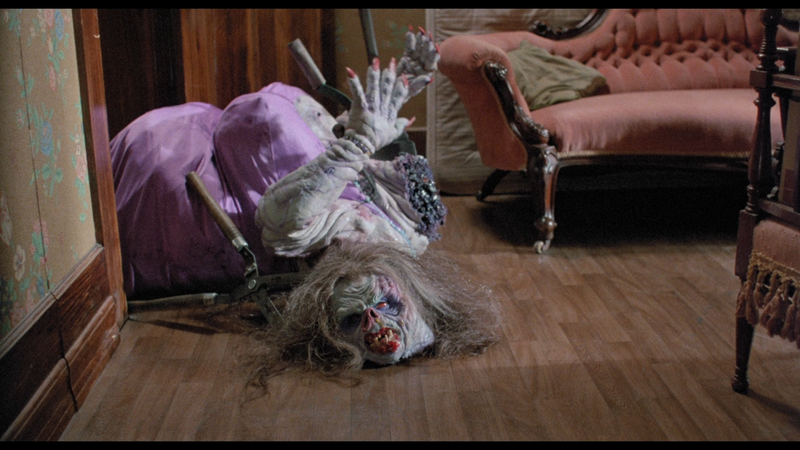 His ex-wife comes to visit and turns into the monster that was in the garbage bag from the beginning of the review. His neighbor also brings her son over for Roger to babysit and, before the night is through, the monsters will try, unsuccessfully, to kidnap the child. Like I said before, this is a horror comedy, but I don’t think that the two work together very well. First off, the film is not that scary. There are monsters all about, but none of them seem to be all that scary. They look the part, but don’t act it. They just kind of show up, do something, and then we never see them again. 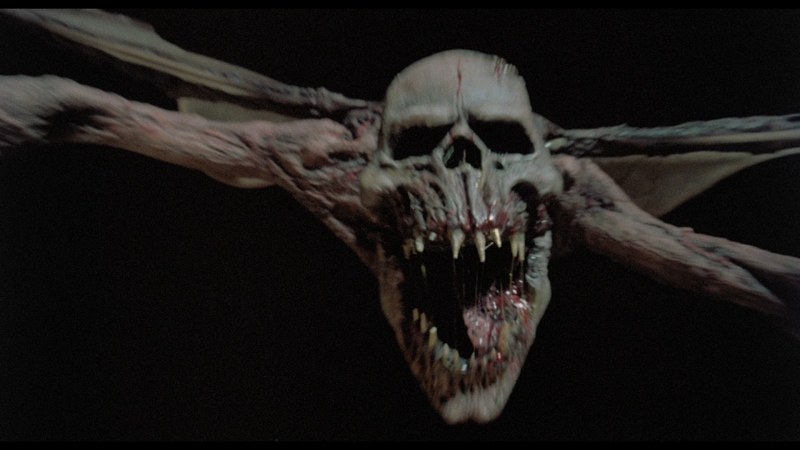 The make-up used for the monsters in the film is fantastic, but you need something for these things to do. to make any jaded person laugh at least once. George Wendt, in particular, is very funny here and serves as the listening block for Roger’s seemingly crazy theories. In fact, Wendt steals Roger’s address book so that he can call Roger’s ex-wife to let her know that he doesn’t think that Roger is doing too well, that he might be having ‘Nam falshbacks. I actually found this a bit refreshing in a horror film that someone cares about someone else’s well-being. So if the horror and the comedy don’t mix, is the film any good? Yes, to a point. 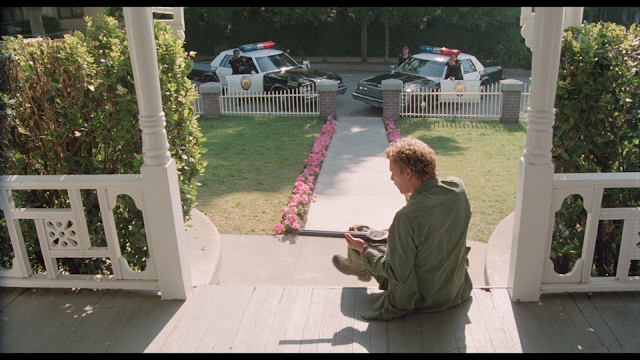 While I did find myself enjoying the film, it does run into points where nothing really happens. The Vietnam sections of the film are mostly filler, not really adding to the story except to make Roger look crazy. I wish that they had dropped these scenes completely, but then the villain of the piece would exist. I just wish that the film focused more on the house and the monsters. I feel that would have been the way to go, but the film is saddled with these scenes that go on forever and add very little. House was a game changer, though. 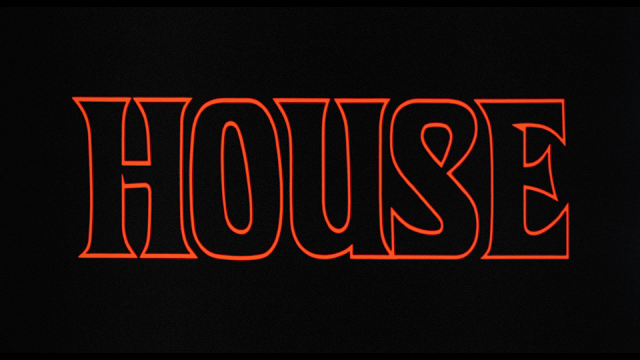 As the slasher craze was dying, House was there to show audiences that horror can be fun. Sure, there still is the mayhem and terror that horror brings, but the lighter tone showed audiences that not all horror is bad. 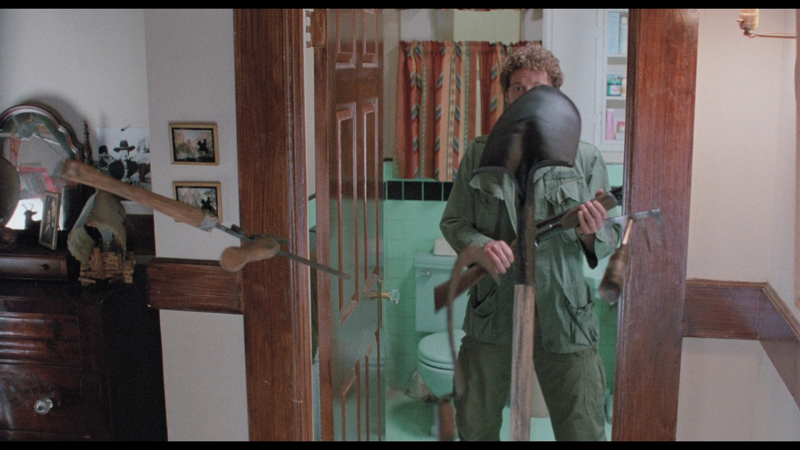 Not to say that slasher films are bad, quite the contrary. Slasher films are fun in their own way, but the market was flooded with them and there needed to be something new brought to the table. House was what was brought to the table, and even though it has many flaws, it is still a film that can be enjoyed. Just lower your expectations and you should be fine. House is a film that is loved by many and loathed by others. I am in the middle. I love aspects of the film, but the tone is all over the place, leaving the film with an identity crisis. These problems aside, I do like the film, even if only slightly. No matter how good or bad the film is, Arrow has given us one hell of a package. The picture is outstanding, even with the framing issues and the sound is pretty good. The special features are worth the time and the packaging is very nice. Give House a watch, you might just like it.